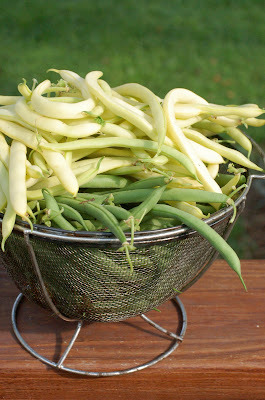 We've eaten a lot of beans from the garden over the last month. 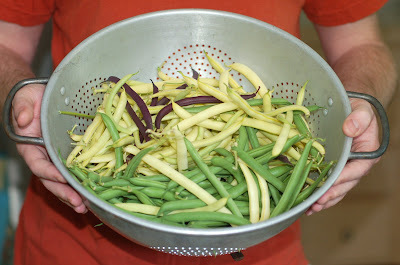 Wax beans, green beans, purple beans -- we've had them by the colander full. 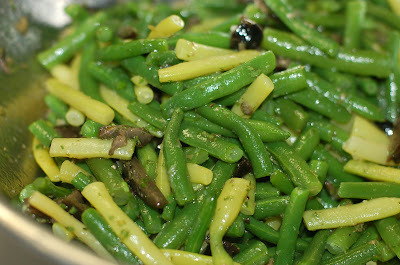 My favorite way to eat fresh beans is in salads with a simple vinaigrette. Quick, easy, no fuss summer food. It's been a long wait for the tomatoes we started from seed back in February. 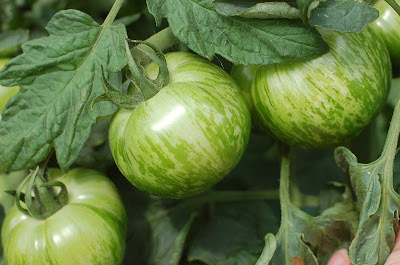 This past weekend we had our first couple of ripe 'Green Zebras.' I love their beautiful green contrast when paired up with regular red tomatoes in a salad. We are about a day away from slicing into the season's first 'Cherokee Purple.' Those were our favorite among the heirloom tomatoes we grew last year. 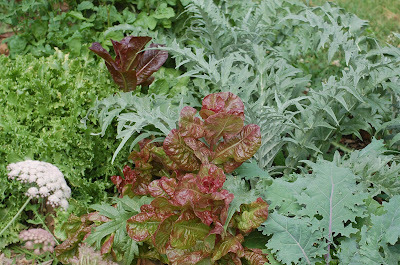 Elsewhere in the garden, one of my favorite scenes is this one: A riotous mess of greens (and reds!) in all manner of textures. In here is curly endive (so bitter that we never eat any of it), and bolting red lettuce and 'Red Russian' kale. The spiky plants are my globe artichokes, which I'm really excited about. No sign of any chokes emerging yet, but the plants are absolutely gorgeous. 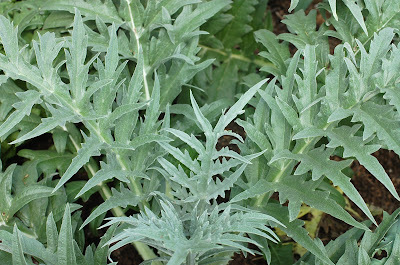 Whether they get any artichokes or not, I'd consider keeping these plants in my landscape just for their pretty and unusual foliage. Here's one of my pickings of beets. These were from a 'Gourmet Blend' of seeds that included 'Golden,' 'Chioggia,' and 'Bull's Blood' red. No matter how many beets I get, I never seem to have enough to suit my liking for them. I perpetually have on my garden to-do list: plant more beets. I've started sowing seeds for fall crops. 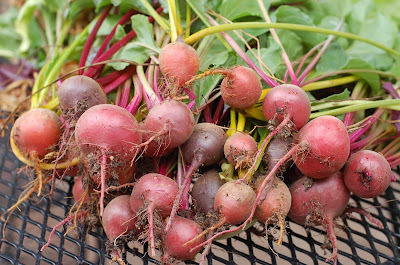 Yes, beets are in, and so is kale, kohlrabi, carrots, and cauliflower. I have five brussels sprouts plants growing. Last year I failed miserably with brussels, having planted them too late in the season. This time around I planted seedlings right after we dug out our garlic at the end of June. So far the plants look healthy and content, and I can see an add-on of growth with each passing day. Promising! I should be harvesting my first beans very soon, and my tomatoes are growing nicely, but a way away from being red. I did harvest some beetroot at the weekend though. Can you suggest a resource or book that explains what can be planted when? I never seem to have the time to plant things in the spring, so I thought I'd like to try a late summer/fall garden. Thanks! i think i'll plant the same tomatoes as you next year (adding the Green Zebra and Cherokee Purple . . . those sound so delicious). One question, though - how many bean plants did you plant? I have about twelve but it has only really given me about a handful here and there. I wanted a bounty like you have had. I thought i was planting low-bush beans but they ended up being tall plants, ,too. We're growing that handsome Cherokee Purple this year. We managed to snag a seedling at the farmer's market in the spring, and it's been such a vigorous plant this summer. It's a stunner. We've picked about three so far this season. Love it! The Weekend Gardener Grow Guide is a good basic reference tool to help you determine when to plant. I also use various books, such as "Square Foot Gardening," for guidance on how many days to count back from the frost date. And I learn a lot from trial and error from year to year! I'm guessing I had about 24 bush bean plants in the first round of sowing, and maybe about 12 plants in a second round I sowed several weeks later. When the first round was dying back, the second round was just getting started, so I had beans non-stop for several weeks. Thanks, all, for your visits and your questions! your green zebras look great. mine are struggling. too bad. on the bright side the beans are coming on fast. and thanks for the reminder about getting in some late season crops. i'd better get moving. Yes, my beans have just started as well. That is a lovely way to eat them. I might make a nicoise salad with cold potatoes, black olives and anchovies. I like your beet mix! We picked our first beets the other day, too ` yum! Wow! 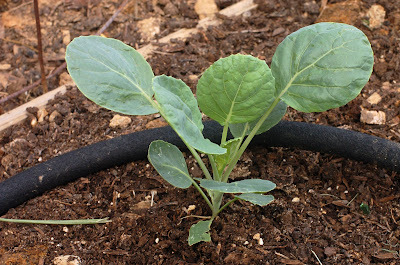 I use to have a vegetable garden years ago but since I had children I don't seem to have the time. Your vegetables look absolutely delightful. Keep up the great work. Hi there - I've just found your site via a lazy afternoon's wander on the internet and wow I'm so glad I did! You are achieving everything that we are just setting out on the road to achieve - organic home grown goodness - well done - I'll be back often! So many choices so many delicious bites. Looks great. Can't wait to hear about the tasty wonders of everything else! I had the same problem with my beans. We put in so many and never thought of how we were even going to use them. Thankfully there is a big family event coming up so we'll be able to get them all used up! We too love beetroots. The golden ones are delicious. We're growing that handsome Cherokee Purple this year. We managed to snag a seedling at the farmer's market in the spring, and it's been such a vigorous plant this summer. Beans r my favorite,I love to eat beans with meat or chicken on it, and I put some garlic for the best taste. I hated brussel sprouts before I tried these... they are soooo yummy, hot or cold!! Thank you! !